With no seat is more than 50 feet from the ring, The Big Apple Circus leaps into its 33rd Season and returns to Boston with an all-new show entitled "Dance On!" Performances at Boston's City Hall Plaza will take place from April 2 - May 15. Among those invited to the dance: An awesome troupe of monocyclists and lasso twirlers from China! A mind–bending group of Mongolian contortionists! A kinetic collection of Kenyan athletes who shimmy up a pole as though gravity were a joke! A herd of hoofers -- twelve miniature horses in an equine chorus line! And an Ethiopian juggler with a lively up–tempo act! The Host for this year's merriment will be Ringmaster Kevin Venardos, aided with antic abandon by star clowns Rob Torres and the always-lovable Grandma! Under the artistic direction of Guillaume Dufresnoy, the line-up for the 2011 show includes:. • From China, the highly skilled Wuqiao Acrobatic Troupe, performing a powerful lasso act and an acrobatic ensemble on monocycles. • From America, the talented, irrepressible, delightful comic Mark Gindick (above), taking a witty turn under the Big Top as The Man Who Dances. • From Bulgaria, Big Apple Circus company member Andrey Mantchev (at left) offering a phenomenal hand–balancing performance! • From Ethiopia, Girma Tshehai, who excites with an act of juggling and percussion combined. • From Africa, The Kenyan Boys, who will pump up the fun with a high-energy dance and pole act with feats of incredible strength and agility performed to the contagious rhythms of world beat music. • From Russia, lovely and graceful Regina Dobrovitskaya, embarking on a romantic trip to the heavens on her cloud swing. • From Mongolia, X Bud Roses Troupe, five mysterious young ladies who dazzle with a contortion act of strength and flexibility. • From America, the beautiful Jenny Vidbel (at left), filling the ring with a playful chorus line of 12 white mini-horses. • And from America, Barry Lubin, a.k.a. Grandma, as the lively and lovable grand lady of belly laughs. Broadway sensation and singer/actor extraordinaire Eric Michael Gillett takes the reins as stage director. Award winning choreographer Peter Pucci spices things up with some fancy footwork. Tony Award winner Ann Hould-Ward joins the Big Apple Circus for her first time with an alluring ensemble of costumes. Tony Award winning scenic designer Todd Rosenthal returns to create a dazzling new set. Rob Slowik returns as musical director with the brilliant Big Apple Circus Band performing new compositions by five composer/arrangers, including Dan Furman, who wrote the show’s theme “Dance of Life,” and Emmy Award winner Paul Rolnick. 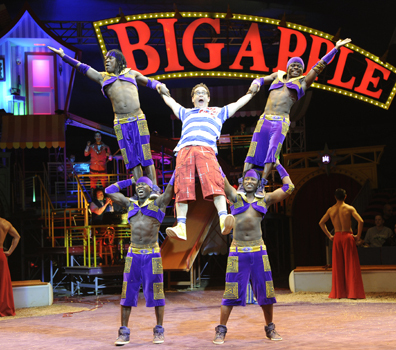 For 33 years the Big Apple Circus, New York’s original one-ring circus, has been delighting audiences of all ages under its Big Top by presenting the finest in live family entertainment featuring world-class circus artistry. 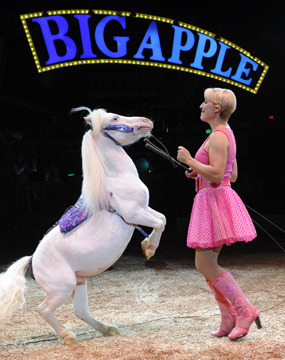 The Big Apple Circus is a not-for-profit performing arts and outreach institution committed to invigorating the communities they serve with the joy and wonder of classical circus. Tax-deductible contributions made by corporations, foundations and individuals enable the Big Apple Circus to bring its special magic to diverse audiences through its outreach programs — Clown Care, Vaudeville Caravan, Circus After School, Circus For All! and Circus of the Senses -- as well as its critically acclaimed performances. For tickets and information, call 888-541-3750 or visit bigapplecircus.org. Beginning Saturday, March 19, a satellite Box Office will be open daily on City Hall Plaza from 10 a.m. to 6 p.m.. The regular Circus Box Office will open in front of the Big Top on Friday, April 1.